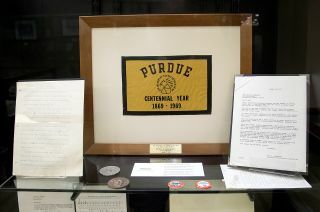 A Purdue University centennial flag that was flown to the moon on Apollo 11 in 1969 is just one of many items on display in "Apollo in the Archives: Selections from the Neil A. Armstrong Papers," a new exhibition at the Indiana school. "This exhibition offers the public an opportunity to get to know Armstrong and the steps leading up to the Apollo 11 mission through access to Armstrong's papers," said curator Tracy Grimm, the associate head of Purdue Archives and Special Collections and the Barron Hilton Archivist for Flight and Space Exploration, in a statement. Returning to his alma mater to receive an honorary doctorate in January 1970, Neil Armstrong presents Purdue University president Frederick Hovde with a Purdue Centennial flag that was carried to the moon on the Apollo 11 mission. Tracy Grimm, associate head of Purdue University's Archives and Special Collections and Barron Hilton Archivist for flight and space exploration conducts a tour of "Apollo in the Archives: Selections from the Neil A. Armstrong Papers" exhibit. Watch a video about Purdue University’s Neil Armstrong archives at collectSPACE.